In behind the overgrowth of branches in this photo you can see a basketball net. The backboard is well worn from over two decades of weather and bank shots. The ground pounded down from heavy footsteps and layup pathways. Hours were spent here in every season. Even waist deep winter storms could never stop me from my overactive imagination. Multiple fake NBA championships were won at this net. Mostly because the game-winning three-pointer would be called back on “fouls” from the opposing team. This would give the “refs” the chance to “reset” the clock and allow for one more long-distance shot at the net. Many of these “games” would go on well past 2 regulation NBA games without “players” getting fouled out or the refs getting called for some seriously questionable calls. As a kid this was one of my sanctuaries. A short walk outside the door of Dad’s house. I remember many nights walking out here after supper and coming in only when it was way too late to even think. By the late hours the court was only lit by the faint overcast of a nearby street light. It barely allowed for a decent clear view of the basket. One evening, my brother and I wasted several hours attempting to connect a football throw from the opposite end of the yard. He succeeded after at least two hours of throwing. Did not even strike the backboard or the rim on that winning shot. Clear sailing through the mesh. The court has not been used for some time. Branches have taken over the once clear and wide air paths for flying basketballs. Many have walked the grass in front and sank many shots while launching them from almost every piece of the land. My parents rarely every called me in during a school night that I was out here. Why would they? I was getting decent exercise and doing something that I found calming. 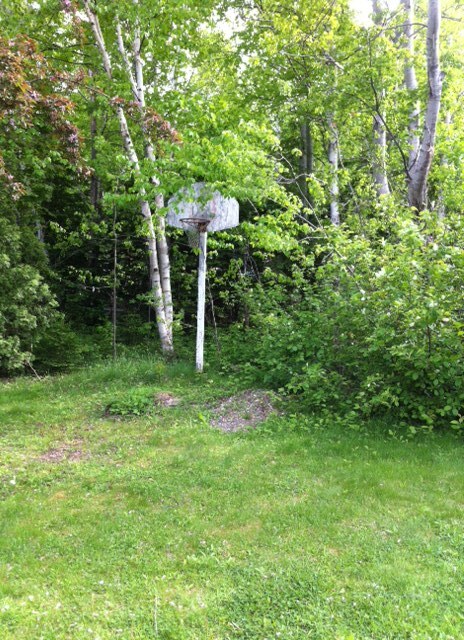 For the brief period that I moved back into the old house before leaving Nova Scotia, I took to this old court again. How great it was to again find peace while playing sport just for fun. I was always grateful that Dad cemented this into the ground. The old court net still stands there today, strong and solid. If the new owners were to tear it down I certainly would understand. I’m happier knowing that the memories of all those shots, all those games, all that time outdoors, will outlast almost anything. Posted in Notes from the Frogpond.Tagged backboard, basketball, basketball court, blizzards, court, football, Nova Scotia, sports, winter.